Cast cu-alloy box or casket mount dating from the 14th-16th century AD. Cast cu-alloy trumpet brooch fragment dating from the early Roman period, ie. c. AD75-175. Cast cu-alloy thimble with individually drilled holes dating from the late medieval period. 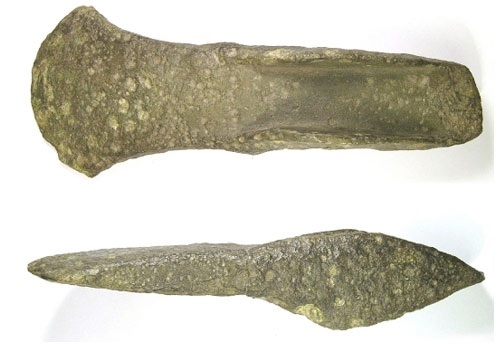 Cast cu-alloy rapier blade dating from the Middle Bronze Age, ca. 1500-1250BC. Medieval iron arrowhead probably dating from the 12th-15th century. A single piece of a post-medieval composite window, square in shape, dating from the 17th century. Cast cu-alloy fragment of a dirk or rapier dating from the early Late Bronze Age, i.e. c. 1200-1100BC. Cast cu-alloy short flanged axe dating from the Middle Bronze, ca. 1500-1150BC. Cast cu-alloy flanged axe dating from the Middle Bronze Age, i.e. c. 1500-1300BC. Cast copper alloy one-piece decorative saddle pommel. Incomplete socketed side-looped spearhead dating to the Middle Bronze Age. Lead-alloy ampulla dating from the medieval period. Silver hammered groat of Henry VII dating from c. AD1490-1504. Early Roman silver denarius of Faustina I (Faustine the Elder) dating from c. AD141+ RIC : 3 (Antoninus) 194a of AD141+ Denomination. Cast cu-alloy bar from a now incomplete cast copper-alloy post-medieval purse, dating from the early 16th century. Cast copper-alloy late Iron Age to early Roman plain terret ring. Cast lead-alloy tank dating from the later Saxon period. Large cast cu-alloy button and loop fastener dating from the Late Iron Age/ Roman period.